They rode through life together. They were married January 16, 1944 by a Navy chaplain at a YMCA and a dozen eager sailors served as their witnesses. After two months together, Chuck was sent to France and they spent 17 months apart. That was too much for both of them. And so for the next 72 years they were inseparable. Chuck died August 7 and Harriet passed away September 10th. Today I received this note from their family. Your book was such a blessing to our family. We had several copies that we passed around at their celebration Sunday. A copy always sat on their dressing table which we showed to all their many health care providers. If Mom was having a bad day, they would sing “Bicycle Built for Two” and that would cheer her up. Thank you for writing such a meaningful book. But I’m the one who has been blessed to meet such amazing people and to share just a small part of their lives. Their stories have become part of my own story and I’m forever thankful. I was privileged to interview Stan Parks, 92, for this Saturday feature in the Spokesman Review. Stan Parks, 92, has been many things: sailor, dentist, world traveler, husband, father, grandfather, photographer, sculptor, civic leader. Recently, he added a new title to his resume: author. In March he published his first novel, “Jakob’s Ladies,” through Gray Dog Press. Tackling new projects is second nature to Parks, who also serves as president of the Spokane Downtown Kiwanis Club. “Serendipity” is a word he uses often to describe the many opportunities he’s been able to embrace during his lifetime. Born and raised in Chicago, Parks left his studies at Loyola University to join the Navy in 1942. “Well, they let me finish my year at Loyola because I was part of the V-12 program,” he said. The V-12 program was designed to supplement the force of commissioned officers in the U.S. Navy during WWII. The newly commissioned lieutenant junior grade was assigned to the USS LST-53, a tank landing ship, recently returned from the invasion of Normandy. Parks and his crew and were sent to the Pacific theater. After the war, he resumed his studies at Loyola. One evening a friend invited Parks to join him and his wife for dinner. Unbeknownst to Parks, he wasn’t the only guest. More than six decades have passed since that fateful meeting, but his eyes still light up at the mention of her name. “We married on Dec. 28, 1947,” he said. They settled in Aurora where Parks established a thriving dental practice and where they raised their four children. In 1978, he visited Guatemala, volunteering his time to provide dental services at a medical mission run by the Benedictines. The trip proved eye-opening for Parks, who mostly cared for the students at the mission school. He knew he’d have to return, which he did almost every year until 2004. With other dentists, he established a modern dental clinic, complete with everything they’d need to care for patients. After 32 years, Parks retired and he and Norie moved to Fort Meyers, Florida. His retirement from dentistry allowed him to pursue other passions. And there were the boats. The Norie 1, 2 and 3. When their son moved to Spokane, Parks and his wife enjoyed visiting the area so much, they purchased a condo so they could spend more time here. He’s always had an artist’s eye; framed photographs he’s taken throughout the years line the walls of his South Hill home. But he also likes to work with his hands, so when an opportunity to take a sculpting class from Sister Paula Turnbull came, he seized it. “Talk about serendipity,” he said, pointing to several busts that he created under her tutelage. One of those pieces is a bas relief featuring the face of his beloved Norie, who died five years ago. Tears fill his eyes when he says her name. After her death, he moved to Spokane permanently to be near his son. He went to see Turnbull upon his return to find out if she was offering more classes. When he heard about a writing class at the Sinto Senior Activity Center he decided to take it. He’d already penned his memoir. “Well, it’s not really finished,” he said. But he wanted to try his hand at fiction. With encouragement from his writing group, he wrote “Jakob’s Ladies,” a historical novel set in 1895, about a dentist who goes out west to Sheridan, Wyoming, to launch his practice. Parks did quite a bit of research, even traveling to Sheridan. He’s pondering a sequel, but he has plenty to keep him busy. He’s always been part of civic groups, so his leadership of the Downtown Kiwanis is a good fit. At 92, he’s not resting on any laurels. Last week I was privileged to interview Leon and Dorothy Williams, who celebrated their 69th anniversary in April. The Huntington Park Ballroom was awash in men in uniform in 1946, but Dorothy Wunderlich, 17, had eyes for only one. A tall, handsome sailor with piercing blue eyes had shown up late, but still managed to secure a dance with Dorothy. From their log home in Elk, Dorothy smiled at her husband, Leon Williams. Leon didn’t mind a bit. The 19-year-old had survived a rough childhood and already spent months at sea while serving with the Pacific fleet. He never knew his father, and his stepfather was abusive. When he was 8, his stepfather was beating him and Leon’s 11-year-old brother Bud jumped on his back to try to end the beating. Their stepfather kicked them out. “My grandparents raised me and my brother,” Leon said. The boys grew up in Milford, Utah. Bud dropped out of school his senior year to join the Navy, and Leon followed suit at 16 and was sent to Farragut Naval Training Station. Hunting skills honed in Utah came in handy. 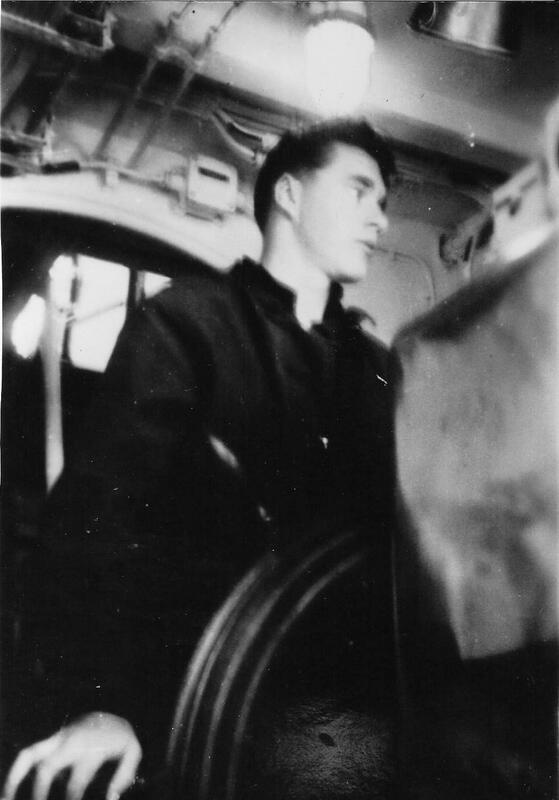 His marksmanship earned him a spot as a gunner’s mate aboard the USS Ammen. He also served on the USS St. Paul. Dorothy pulled a yellowed and stained Japanese flag from a box. “This is proof he was there,” she said. Leon explained that a fellow sailor had given him the flag during the invasion of Okinawa. She also saved his blue wool sailor’s cap and every letter he wrote to her. And there were letters – because Leon was smitten after that single dance, and when he next had liberty, he hustled to the ballroom to meet Dorothy. “He took me home on the bus afterward,” she said. Leon was transferred to San Francisco, so letters flew back and forth. When he accrued enough leave time and knew he was eligible for discharge, he called her and told her to set a date for the wedding. To his surprise, he had to get his mother’s written permission to marry because he wasn’t 21. They married April 6, 1947, and honeymooned in Las Vegas at his mother’s house. Leon’s brother and uncle came to Vegas to pick up a tractor and took the newlyweds back with them to Milford. “The four of us were crammed into a tiny cab of a truck, hauling a tractor,” Dorothy said. Leon took a job as the night marshal in Milford, but when an opportunity arose to work for the railroad, he jumped at the chance. He didn’t have a high school diploma, but a friend wrote “equivalent to” on the space for education and that was good enough. The pay was better and he needed the money. The first two of their nine children had been born in 1948 and 1949. In 1952, Union Pacific Railroad moved the family to Norwalk, California. “I started as brakeman and was later promoted to conductor,” Leon said. After several years in Norwalk, they bought a small ranch in Mira Loma, where their family flourished. Dorothy had been the oldest of nine, so she was used to a big family. However, replicating her family of origin was far from her mind when she married. “I only wanted two!” she said. But Leon relished being surrounded by four sons and five daughters. Ranch life suited the family. “We had chickens, pigs, horses and a garden,” Dorothy said. Feeding her crew was a full-time job, especially since most evenings a neighbor kid or two would join the family. They even had family vacations. The kids joked that they camped wherever there were railroad tracks. The family would cram into a 1957 Dodge station wagon and set off. It was common for hobos riding the rails to find their campsite. Instead of shooing them away, Dorothy welcomed them and shared whatever meal she’d prepared with the hungry men. “They were so polite to our kids,” she recalled. Once, when they’d graduated from station wagon to truck and camper, a hobo expressed a longing for apple pie. “You bring me some apples, and I’ll bake you a pie,” Dorothy told him. The next day he returned to the campsite with a big box of apples he “found” in a nearby orchard and Dorothy baked an apple pie in the oven in the camper, just as she’d promised. After 38 years with Union Pacific, Leon retired, and he and Dorothy already knew where they wanted to spend their retirement years. One of their sons had moved to Spokane and when Leon and Dorothy came to visit him, they fell in love with the area. “This is heaven on Earth,” Dorothy said of their 40 acres in Elk. All nine of their children live nearby, as do many of their 36 grandchildren and 55 great-grandchildren. And last summer Leon and his brother Bud traveled back to Milford, Utah, where they finally received their high school diplomas. Forty-five students had dropped out of school to serve their country during World War II. Only four are still living, and only Bud and Leon were there to receive their long-awaited diplomas. For Dorothy, 87, the reason for their long marriage is simple. The Patriot Guard Riders stood silently, their flags held aloft as a light rain fell at St. Mary’s Catholic Church in Spokane Valley on Saturday. They’d come to honor Charles Boyer, 95, who died April 15. As a 21-year-old sailor stationed at Naval Air Station Kaneohe, Boyer had earned membership into an exclusive club: the Pearl Harbor Survivors Association. Though he was an aviation machinist’s mate, Boyer was assigned to service and drive the Navy’s trucks at Kaneohe. The morning of Dec. 7, 1941, he’d just dropped off some sailors at church and was on his way back, when he saw several khaki-colored planes approaching fast and low. In newspaper interviews, Boyer shared his memories of the horrific attack. With the truck still moving, Boyer dove out and took shelter under another truck parked a few yards away. He stayed under that truck until the enemy planes passed, then he ran to a large tin shed that served as a garage for the trucks at Kaneohe. He wasn’t the only one frightened. He told of a fellow sailor on guard duty who shot at a fence post. “He swore it moved,” he recalled, grinning. Four years and one day after the attack on Pearl Harbor, he married Irene Britton. They celebrated their 70th anniversary in December. After 20 years, Boyer retired as a chief petty officer, but he couldn’t quite leave Navy life behind. He spent the next 22 years working in civil service for the Navy. At one time there were 125 active members of the Lilac City Chapter of the Pearl Harbor Survivors Association. Only one, Ray Garland, 93, remains. Garland attended Boyer’s funeral on Saturday. “It’s kind of a lonely feeling,” he said. Carol Edgemon Hipperson, author of the Ray Daves biography, “Radioman: An Eyewitness Account of Pearl Harbor and World War II in the Pacific,” also feels Boyer’s loss keenly. She admired his cheerful spirit and compassion. While many knew Charlie Boyer as a Pearl Harbor survivor, to his son, he was just Dad. Just received word that this handsome sailor died October 7. Harvey Shaw was a kind and gentle man who dropped out of high school during WWII and enlisted in the US Navey because he liked to swim! He was proud to have served his country, but even prouder of his 64-year marriage to his wife, Bonnie and of their six children. Rest in peace, Harvey. Thank you for your service and for sharing your story with me.